Inspired by the Catholic Church’s Year of Youth in Australia, the focus of Prison Sunday on November 11 will be youth justice and juvenile detention. Prison Sunday commenced in 2016, during the Year of Mercy, as an initiative of Pope Francis to observe the Jubilee for Prisoners. “We need to nourish the roots of our hope so that they can bear fruit … despite whatever evil we have done. There is no corner of our heart that cannot be touched by God’s love,” Pope Francis said at the time. 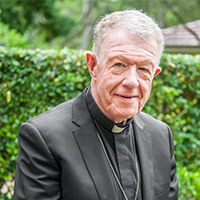 Bishop Terry Brady, Bishops’ Delegate to the Australian Catholic Prisoners Pastoral Care Council (ACPPCC) and chair of the Bishops Commission for Pastoral Life, said youth detention systems in some Australian states and territories were under significant stress, leaving vulnerable young people without the services they need to turn their lives around. “At any time, for example in Victoria, there are around 200 children and young people, aged between 10 and 24 years old, incarcerated in youth justice centres,” he said. “The Royal Commission into the Protection and Detention of Children in the Northern Territory last year also highlighted the need for fundamental reform in detention and child protection systems in the Northern Territory. “Prison Sunday provides a time for all Catholics to think about the conditions in our prisons and what we as Catholics – in our schools, parishes and welfare organisations – can do to make a difference. “As the ACBC Social Justice Statement noted in 2011-2012, we know that the majority of Australia’s prisoners come from the most disadvantaged sections of the community: Indigenous people, the underprivileged and those suffering mental illness. “Prison chaplains are a key group working alongside prisoners, their families and prison authorities. Through their ministry, they personify the Scripture quote from the Book of Ruth: ‘Wherever you go, I shall go’. “We thank those working in prison chaplaincy for their tireless, difficult and dedicated work, serving those unseen members of our community and supporting prisoners’ families through trying times,” Bishop Brady said. “We pray also at this time for those innocent people impacted by crime and the effect that crime has had on their lives. Bishop Brady said many parishes are involved in promoting understanding and inclusivity of marginalised people. “There is much that parishes can do to reach out and build bridges with prisoners and their families – by becoming a prison visitor; serving as a court volunteer; providing family support post-release; and fund-raising to provide toiletry packs for prisoners on release,” he said. Bishop Brady encouraged parishes to have conversations with their local prison chaplain and related organisations working in this area, such as the local Saint Vincent de Paul Society, CatholicCare and Jesuit Social Services. “Many Catholic Church agencies work in this area and can be valuable sources of information to discover how parishes can help those in need,” he said. For more information and resources about Prison Sunday, go to the Australian Catholic Bishops Conference website. This entry was posted in Uncategorized on October 18, 2018 by ACBC Communications.